February 18, 2016 – Astronomers using NASA’s Hubble Space Telescope have measured the rotation rate of an extreme exoplanet by observing the varied brightness in its atmosphere. This is the first measurement of the rotation of a massive exoplanet using direct imaging. The planet, called 2M1207b, is about four times more massive than Jupiter and is dubbed a “super-Jupiter.” It is a companion to a failed star known as a brown dwarf, orbiting the object at a distance of 5 billion miles. By contrast, Jupiter is approximately 500 million miles from the sun. The brown dwarf is known as 2M1207. The system resides 170 light-years away from Earth. Hubble’s image stability, high resolution, and high-contrast imaging capabilities allowed astronomers to precisely measure the planet’s brightness changes as it spins. The researchers attribute the brightness variation to complex clouds patterns in the planet’s atmosphere. The new Hubble measurements not only verify the presence of these clouds, but also show that the cloud layers are patchy and colorless. Astronomers first observed the massive exoplanet 10 years ago with Hubble. The observations revealed that the exoplanet’s atmosphere is hot enough to have “rain” clouds made of silicates: vaporized rock that cools down to form tiny particles with sizes similar to those in cigarette smoke. Deeper into the atmosphere, iron droplets are forming and falling like rain, eventually evaporating as they enter the lower levels of the atmosphere. The super-Jupiter is so hot that it appears brightest in infrared light. Astronomers used Hubble’s Wide Field Camera 3, built by Ball Aerospace, to analyze the exoplanet in infrared light to explore the object’s cloud cover and measure its rotation rate. The planet is hot because it is only about 10 million years old and is still contracting and cooling. For comparison, Jupiter in our solar system is about 4.5 billion years old. 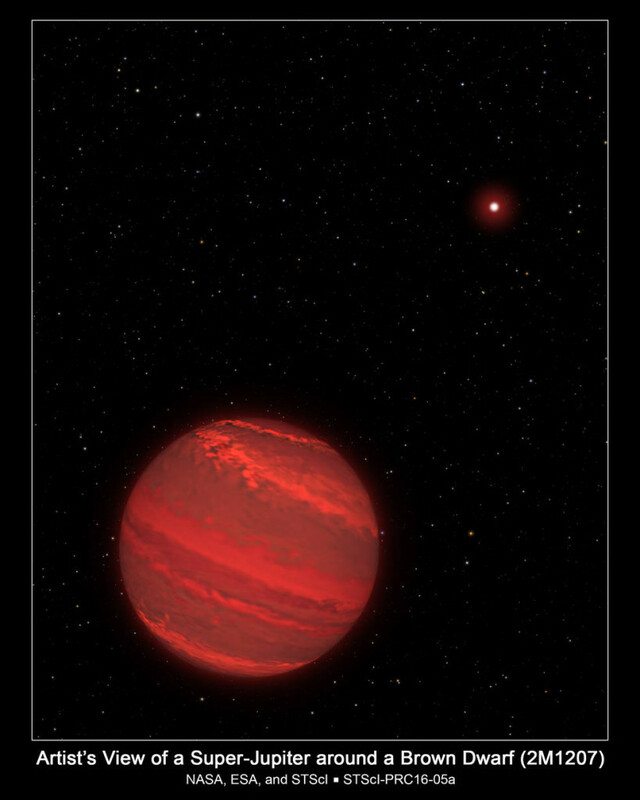 This super-Jupiter is only about five to seven times less massive than its brown-dwarf host. By contrast, our sun is about 1,000 times more massive than Jupiter. “So this is a very good clue that the 2M1207 system we studied formed differently than our own solar system,” Zhou explained. The planets orbiting our sun formed inside a circumstellar disk through accretion. But the super-Jupiter and its companion may have formed throughout the gravitational collapse of a pair of separate disks. “Our study demonstrates that Hubble and its successor, NASA’s James Webb Space Telescope, will be able to derive cloud maps for exoplanets, based on the light we receive from them,” Apai said. Indeed, this super-Jupiter is an ideal target for the Webb telescope, an infrared space observatory scheduled to launch in 2018. Webb will help astronomers better determine the exoplanet’s atmospheric composition and derive detailed maps from brightness changes with the new technique demonstrated with the Hubble observations. Results from this study appear in the February 11, 2016, edition of The Astrophysical Journal.